MELBOURNE (Reuters) – BP Plc (BP.L) has agreed to buy U.S. shale oil and gas assets from global miner BHP Billiton (BLT.L) (BHP.AX) for $10.5 billion (£8.01 billion), expanding the British oil major’s footprint in oil-rich onshore basins in its biggest deal in nearly 20 years. “This is a transformational acquisition for our Lower 48 business, a major step in delivering our upstream strategy and a world-class addition to BP’s distinctive portfolio,” BP chief Executive Bob Dudley said in a statement. Has Anglo American found something big in Brazil? 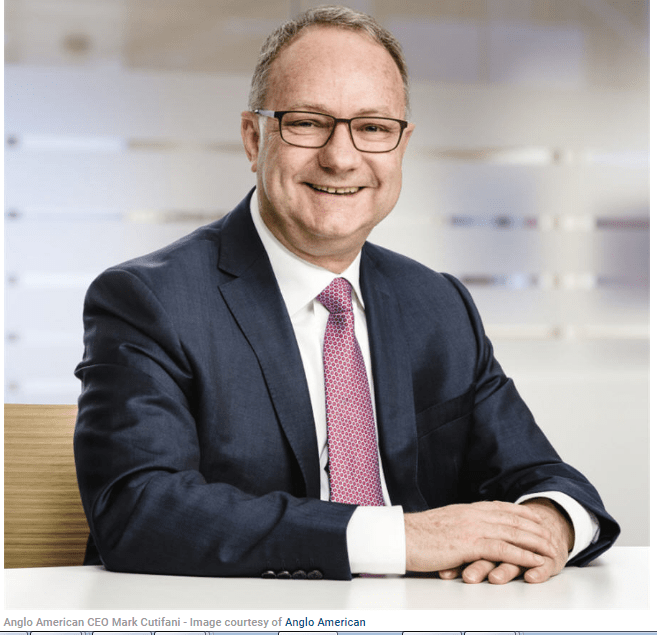 (Bloomberg) — Anglo American Plc’s chief executive officer was being a little cryptic with investors on Thursday, but the message was clear: the company might have found an exciting copper deposit in Brazil. CEO Mark Cutifani briefly flagged a 19,000-square kilometer piece of land (an area about the size of Israel) that the miner has pegged in Brazil, where it’s looking for copper. 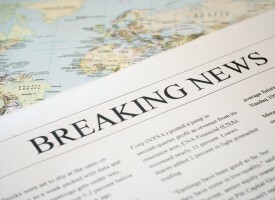 When pushed by a Morgan Stanley analyst for more details, he hinted that there was something interesting to be found. Copper deposits are among the hottest assets in mining right now, with the world’s top producers becoming increasingly bullish on the metal. There are expectations that bigger power grids around the world and an electric-vehicle boom will boost demand, while supplies are constrained. 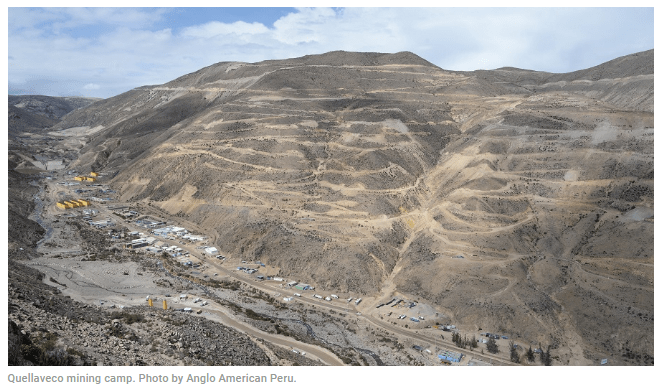 Highlighting its enthusiasm for copper, Anglo today said it’s given the go ahead for a giant new $5 billion mine in Peru. Still, Cutifani was keen to point out that nothing is ever certain in the industry. Canada’s Barrick Gold sees significant benefits in a partnership with the cash-rich Chinese firm Shandong Gold. TOKYO — Chinese gold miners are on the hunt for mines overseas, spurred by robust prices of the precious metal. Already the world’s largest gold producer, China’s sees overseas mines as part of the country’s long-term strategic goals of expanding its economic influence and building up its manufacturing might. Part of this agenda involves working with foreign partners. In early July, Canada’s Barrick Gold, the world’s largest bullion producer, said it would expand cooperation with China’s Shandong Gold Group in developing gold mines. “This agreement will allow us to take our partnership to the next level,” said Barrick Executive Chairman John Thornton about the “enhanced strategic cooperation agreement” with Shandong Gold. The two companies are building on a deal struck in April 2017 under which Shandong Gold acquired 50% of Barrick’s Veladero mine in Argentina. The latest move is a clear signal that the Canadian miner has a strong interest in working more closely with the cash-rich Chinese company. It seems likely that Barrick will want to expand the scope of its partnership into areas such as the joint acquisitions of mines. Since 2013, when gold prices plunged 30% in a year, China has been ramping up overseas gold mining investments. According to state-controlled media, Shandong Gold aims to expand overseas operations to become one of the world’s top 10 gold miners. Such expansion of gold mining operations abroad could significantly increase supplies, causing prices to fall. But Beijing seems to believe high-quality gold mining projects abroad are essential to ensuring it can weather periods of low prices. Gold prices are currently hovering in a range of between $1,200 and $1,300 per troy ounce, up nearly 30% from a decade ago. Developing gold mines is a long-term, risky process that requires years of planning, research and infrastructure development. 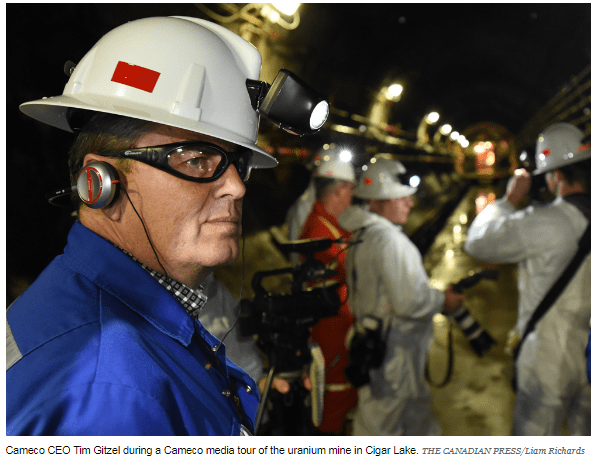 Miners must conduct extensive analysis on how much gold a ton of ore actually contains. For its part, Barrick can “spread the risks of developing mines by using Chinese money,” said gold market analyst Itsuo Toshima. Yoshiyuki Kita, a senior executive in charge of metals at Japan Oil, Gas and Metals National Corp., an independent government agency, says China’s stricter environmental regulations are a factor in the desire to expand abroad. “As the authorities take stronger environmental policy measures to reduce the use of mercury in gold mining and smelting, it is becoming increasingly difficult for Chinese miners to maintain operations of small mines which account for most of the gold mines in China,” Kita said. Mercury and cyanide, which are used to separate gold from the ore, are highly polluting. Chinese miners are raising their chances of earning high investment returns by improving their mine evaluation and refining skills, Kita added. Domestic gold production in China fell 7% in 2017 from the previous year. Beijing also seeks secure future gold supplies for strategic reasons. Under President Xi Jinping’s “Made in China 2025” initiative, the country aims to become a global technology and manufacturing powerhouse in key sectors such as robotics and health care. Gold, which is used in electronic substrates, is strategically important for this effort. Beijing has tight controls on taking gold out of the country. China’s central bank, the People’s Bank of China, holds the world’s sixth largest gold reserves, with 1,843 tons. While the central bank has not bought gold since 2017, China plans to increase its gold reserves to back its currency, the yuan, over the long term as it seeks to internationalize it, said Takahiro Morita, chief of Morita & Associates, a gold and platinum market research company. China is also the world’s largest consumer of gold, mainly through jewelry purchases. “As the world’s leading gold consumer, China wants to gain the power to set gold prices in the future,” Morita said. China’s Belt and Road Initiative, announced in 2013 to develop a network of international trade routes, targets wide areas of Eurasia, including such major gold consuming countries as India and Kazakhstan. Samuel Bello, Abuja The government of South Korea has expressed desire to invest in the Nigerian mining sector and renew the collaborative efforts of both countries. South Korean Ambassador to Nigeria, Mr. Lee In-tae, disclosed to newsmen in Abuja during a courtesy visit to the Minister of State for Mines and Steel Development, Hon. Abubakar Bawa Bwari, that there are many South Korean investors who are interested in investing in Nigeria because of the abundant resources in the country. The president of Peru’s National Society of Mining, Petroleum, and Energy, Pablo de la Flor, issued a statement today saying that Anglo American (LON:AAL) and Mitsubishi’s joint venture to develop the Quelleveco project marks a new era for the country’s mining industry. According to de la Flor, the project located in the southern Moquegua region will create 9,000 jobs during its construction phase and additional 2,500 jobs once it goes into production. “It is a project that will inject some energy into the local economy and will have a positive impact throughout Moquegua and southern Peru,” he wrote in the brief. De la Flor also said that with an investment of over $5 billion, Quelleveco will create positive cash flow for the country’s coffers, both at national and local level, through taxes, royalties and mining cannons. “Each time we presented a proposal, the goal post changed,” said outgoing Lundin CEO Paul Conibear on a conference call Thursday. 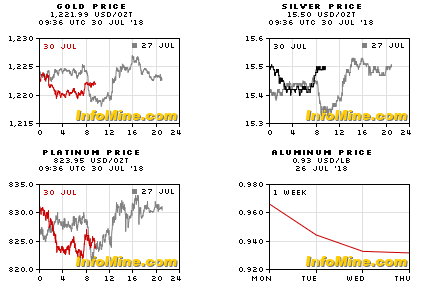 (Bloomberg) — Platinum’s near the lowest in a decade and hedge funds have never been so bearish and that could be good news for prices. The commodity has had a torrid year so far amid ample supplies and as investors lost faith in precious metals. While speculators are betting on more declines, the large bearish wagers mean prices could be poised to rebound, according to ING Bank NV. The bank, along with Commerzbank AG and Macquarie Group Ltd., says platinum may be near a bottom. Platinum, which is mostly used to curb vehicle emissions, has been hit by concerns about weaker diesel demand as well as a stronger dollar. 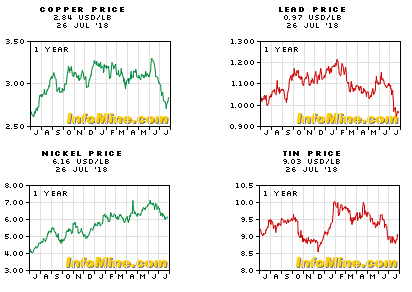 With prices down more than 50 percent from a 2011 peak, that’s hurting mine profits in top producer South Africa, but also adding to speculation that car companies could substitute in more platinum for sister metal palladium in auto catalysts. The ore sorting equipment that Canada-based tungsten miner Almonty Industries plans to use at its Panasqueira mine, in Portugal, has arrived on site, after customs released the shipment earlier in the week. Almonty said the equipment, which is being assembled under an agreement with Cronimet South Africa, would allow additional reclamation of the coarse fraction tailings and would result in a production increase of about 10% in the Panasqueira mine’s production. The industrial tests are forecast to run during the second half of August and the commissioning of the installation is planned for late August. “We have overcome difficult times and used the time wisely to lay the foundation for the success we have now. 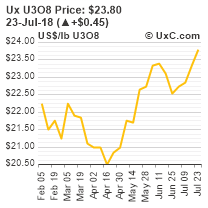 “Now it is time to reap the benefits of our hard work while global tungsten prices are at four-year highs with APT price recently breaking through $350/MTU, further enhanced by current foreign exchange rates. The days of cheap tungsten are long gone and we’ve entered new territory now,” said Almonty CEO Lewis Black. Australian heavy rare earths developer, Northern Minerals Limited (ASX: NTU) has announced the official opening of the Browns Range Heavy Rare Earths Pilot Plant Project in the East Kimberley region of WA. The Project will be opened on Friday 27th July 2018 by the Hon. Alannah MacTiernan MLC, Minister for Regional Development; Agriculture and Food; Minister assisting the Minister for State Development, Jobs and Trade. The Project is now officially the first producer of heavy rare earths (HREs) outside of China. The main products are dysprosium and terbium. 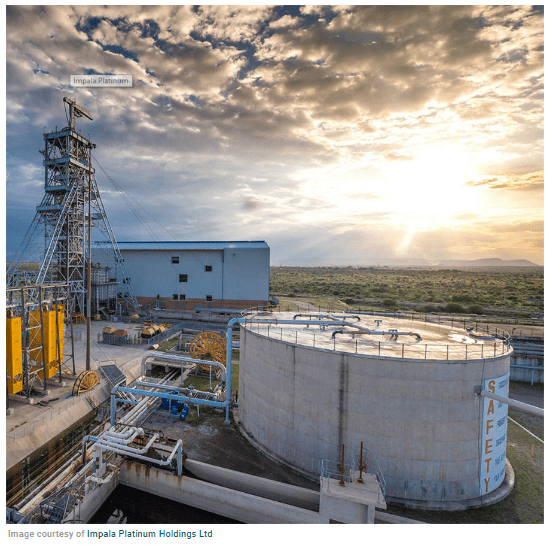 Australian heavy rare earths producer Northern Minerals Limited (ASX: NTU) (the Company) is pleased to announce the official opening of the Browns Range Heavy Rare Earths Pilot Plant Project in the East Kimberley region of WA. The Project will be opened on Friday 27th July 2018 by the Hon. Alannah MacTiernan MLC, Minister for Regional Development; Agriculture and Food; Minister assisting the Minister for State Development, Jobs and Trade and comes exactly a year to the day since WA Premier, the Hon. Mark McGowan MLA turned the first sod to commence construction. The Project is now officially the first producer of heavy rare earths (HREs) outside of China. The main products are dysprosium and terbium. Dysprosium is an essential component in the success of the electric vehicle (EV) evolution. Permanent magnet electric motors are the key drivers of EVs and dysprosium is a vital ingredient as it reduces the weight requirement and allows operation at very high temperatures. Nearly all EV permanent magnets contain dysprosium. With EV demand expected to grow to in excess of 20 million vehicles per annum by 2025, it is a critical material in order for this momentum to continue. As the only dysprosium producer outside China, Northern Minerals is well placed to become a significant, stable supplier of this important element. Dysprosium and terbium are also used in wind turbines, industrial robots, air conditioning and many other new technologies which are in development. The first stage – a three-year pilot plant project – will be used to assess the economic and technical feasibility of a full-scale project. Browns Range is globally significant as it will provide an alternative source of heavy rare earths supply outside of China. With increasing momentum in the electric vehicle revolution, many offtake partners and downstream processors are keen to secure reliable supply outside of China. “The opening of the Browns Range Heavy Rare Earths Project is nearly eight years in the making, since the initial discovery in 2010. “There are not too many times when a Managing Director can stand up and launch a new industry in Australia and this is what we are doing today. “Australia is now a heavy rare earths producer. “I am extremely proud of the entire Northern Minerals team as well as our construction partners that have helped make this project a reality.